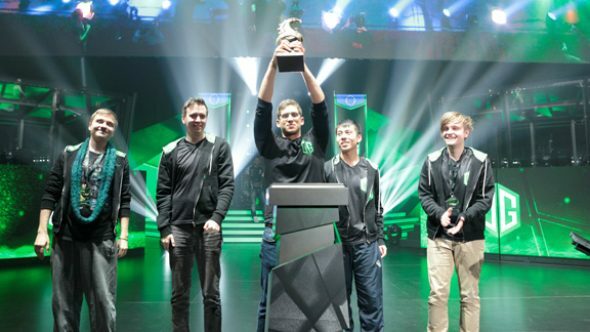 The green machine OG has become the first team to win three Valve Majors by winning Dota 2’s $3m Boston Major tournament and reclaiming the Eaglesong last night. The grand final also saw the countdown to Dota 2’s 7.00 patch revealed, we’ll have all the major changes here. Formed last year – before lifting the Eaglesong a first time at the Frankfurt Major – by Johann ‘N0tail’ Sundstein and Tal ‘Fly’ Aizik, the team has won three of the four Major tournaments held between Valve’s massive multi-million dollar The International competitions. Since formation, the team has gone through few changes with new mid-laner Anathan ‘Ana’ Pham, off-laner Gustav ‘s4’ Magnusson and support Jesse ‘Jerax’ Vainikka joining in August after a disappointing TI6 performance for the team. However Fly and N0tail have remained as pillars of the team and been a critical part of each of their three victories at Frankfurt, Manila and now Boston, taking home $1m from each event. Their opponents in the final, Greek side Ad Finem, put up an incredibly spirited defence, with one of the best games of Dota 2 ever played in the third game to claw their way back to a 2-1 deficit in the face of elimination. However they failed to continue their comeback and took runners-up after a 3-1 finish in the fourth game. You can see highlights of that third game below, where Ad Finem more than earn their $500,000 reward with an 80-minute slog into a sneaky back-door play byVerros “Maybe Next Time” Apostolos’ Earthshaker to close out the game.